The meeting in Cochabamba, Bolivia, took place from 10 to 14 October; it brought together 7,000 young people. In addition to young adults from almost all the countries of South America, there was a strong participation of young people from the countryside of Bolivia. The atmosphere just before the start of the meeting is beginning to make our hearts race. There are still many things to be settled, like the number of buses to be hired. It is impossible to count on public transport. At the moment, we need 110. There is also the question of security around the exhibition halls, and the number of families who will be hosts in each parish, so that we can share out the young people evenly. The whole question of accommodation is tricky. We have to decide which groups can stay in parishes where the situation is complex. We have to remember the tensions that occurred last February. There are many wounds from that time that have still not healed and it would not be wise to send young people from the country to certain parishes. We make sure that there is at least one European in each parish and that the Latino Americans are shared out fairly. It is one of the young people who is responsible for this, but he has to constantly consult with the volunteers and the brothers to make sure that what he is preparing is feasible. Things have been a bit violent today. Cochabamba is in the grip of a general transport strike, for an unspecified duration (everyone says this will not last more than 24 hours). This means that all activity stops. People take advantage not to go to work or else they are afraid and do not leave their homes… and they are quite right. In our street today, just in front of our windows we watched a confrontation between the police and a group of demonstrators. This ended with some arrests and tear gas that forced us to close all the windows of the house. Finally, things calmed down around noon and we were able to go to our daily prayer at the cathedral. It is quite incredible: a few hours later you can see nothing at all, but you never can tell how far the escalation of violence may go. Yesterday and today have been overwhelming: there are so many things that have to be thought of! We have to transfer our workplace to the exhibition hall. Over a hundred foreigners, Europeans and Latino Americans, have arrived already. We start at 5 or 6 in the morning and we finish at midnight. It is impressive to see the expectancy of those who are arriving and the welcome the “Cochabambinos” are offering them. There is no doubt; this is a people who know how to make each person feel that he or she is at home, wherever they come from. Their capacity for improvising can not be equaled. It is better not to program things too much, and see how things evolve as they go along. Yesterday, for example, the arrival times were very complicated: people arrived late, there were misunderstandings, but here everything is resolved through two or three telephone calls. Two people from Germany are announced at the airport. Straight away someone says, “Do not worry, we will go and pick them up and then take them to our place to rest.” The capacity of these people to respond is surprising. Today, three of us were speaking on three different TV channels at the same time. In this way we could reach all those who watch TV before work or school. The result was that both telephones at the welcome centre never stopped ringing throughout the whole morning, with offers of help in welcoming people on Wednesday and still more families offering to open their doors. There are many things that still have to be finalized and obviously we are worried about the welcome day on Wednesday. But if we think of all that has happened already, we have no right to be afraid. Like the people of Cochabamba, we will welcome with open arms… and we will improvise! We began welcoming the arrivals early. At 6.30 there were already 300 people waiting, most of them from Peru, Chili and Argentina. Many of them had come the previous evening and we had given them temporary accommodation in a college. During the morning, the flow of arrivals was fluid and calm, but as the hours passed this turned into a torrent. The “Cochabambinos” started arriving at mid day, both from the city and the surrounding regions. They had left home that morning. This was the start of the “feast of colours”, with all the young people from the rural areas wearing their traditional costumes. They waited patiently to be welcomed. 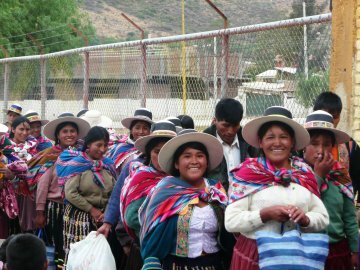 When the Archbishop saw the arrival of a group from one particular rural area of Cochabamba, he was astonished, even a bit worried. Just a month ago, he had been obliged to drop everything and rush to that area following a telephone call from the local priest. The people had caught a thief. Since the culprit had already committed another crime and the local justice had done nothing about it, the people wanted to lynch him. The priest managed to put off the execution, but only for a few hours. The presence of the Archbishop calmed down the leaders and avoided the sentence being carried out. Today, the big surprise was to see nearly all the young people from that place full of joy and ready to take part in our days of reconciliation. The striking feature of the day was no doubt the rain; unusual in Cochabamba, especially when it comes as a storm with high winds. But that did not hinder us from continuing to welcome an ever growing number of people. At 5 o’clock, the “welcome” queue and the “snack” queue got mixed up. Naturally the snack won. The most “latino” event of the day happened when it was time for prayer: five minutes before it started, a general power failure threatened to prevent it taking place at all. After several minutes spent attempting repairs, the people were invited by megaphone to come into the prayer hall, while the choir sang as loudly as they could. The thousands who had already arrived entered right away into a real spirit of prayer. In spite of all the emotion and improvisations, we could feel and let ourselves be filled by a great thirst for prayer and meeting one another. Indeed, it really is possible “to do much with almost nothing”. We also had to improvise in order to continue welcoming the arrivals: in each of the five arrival points, it was cars with their headlights turned on that provided the lighting. The final note was provided by the last arrivals: an enormous group of 150 from Chile, a group of 20 from a neglected area of Argentina, 35 Brazilians from Chapeco who had travelled by bus for three days, crossing a good part of Brazil, the whole of Paraguay, and half of Bolivia. You could see the tiredness on their faces, but above all the joy too: a real spirit of celebration. When they had been welcomed and somebody was fixing up the final details, suddenly instruments started up and the whole welcome area was transformed into an infectious celebration – reminding us that the most important thing of these days was simply to be together! No doubt nothing could have stopped them continuing to express their joy; then one of the transport volunteers announced that buses were waiting for them and their host families were expecting them! Perhaps this is a foretaste of what awaits us these coming days. The parish churches have been transformed: the benches have gone and there is less light; there are icons around the altar, and many young people have come early to prepare for the prayer. The prayers a very simple, humble; it is the young people themselves who have prepared them, who lead them and share them. Following the presentations, both of the parish and of the participants, everybody sets off for the “Campo Ferial”, for the prayer with everyone else. The problems with the electricity are still with us, yet everything works out so that the prayer takes place correctly. There is not enough room in the prayer hall: those who have to remain outside follow closely the songs and the Gospel reading. The silence is intense; who could have imagined that people so joyful and festive would be capable of such interiority? For there is no doubt, they have great depth within. Everybody is impressed by the diversity of the participants. Yesterday, during a meeting where introductions were made, there was enthusistic applause for the 32 countries represented and for every region of Bolivia. The mid day prayer today was very beautiful. What touches people most is the silence. Coming out after the prayer and going towards the meal queues, you can hear the young people humming some of the songs: “Dios es Amor” (Lord God you love us), “Nada te turbe” (Nothing can trouble). But the song they sing most is “Alleluia”. During the prayer, each time the Gospel is proclaimed or another passage read, the sound of the Alleluia resonates very strongly. It seems as if we could go on singing it forever. It is beautiful to see how much intercessory prayer is a fundamental part of the liturgy here in Latin America. Praying for others is at the heart of each celebration. The kyrie eleison is sung with the same vigour as the Alleluia and there is no doubt that God is listening to our prayer! This afternoon we met according to our countries and regions. The meeting for the Bolivians was led by two brothers and by the national youth ministry, to express a continuity that has been started during these days. The Chileans, nearly three hundred of them, had their own meeting. At the end, they decided to start being reconciled without delay, through a gesture. They all came out of the place where they were meeting and went to interrupt the Bolivian meeting, in order to embrace them and give them the kiss of peace. This was one way of thanking them, but above all of asking forgiveness from them for all the problems that are still pending between the two countries. The Brazilians and the Europeans each had their meeting. Then there was the meeting for the rest of Latin America. Three hundred young people from the entire continent tried to find ways of continuing the pilgrimage of trust. There were three lines of discussion: how can prayer be at the heart of my pastoral commitment? Giving a larger place to listening, putting ourselves in the place of others. Going towards the poor with very few means. To the question; “where is God waiting for me when I get back home?”, all the small groups replied, “There is no doubt, it is in daily life”. You can see that in Latin America faith is lived on a day to day basis; that is certainly how people want to live it. Departure day. Once again there are back packs everywhere! But there is less confusion than on arrival day. Now everybody knows where to go and what to do. The Eucharist started at 11 o’clock in the morning. Once again the striking thing was the surprising interiority of these “turbulent” people. In his homily, the Bishop of Cochabamba, Mgr Tito Solari, spoke of the three fruits or lessons of the meeting: first of all Jesus is the guide, the companion on the way, with prayer and silence above all as the meeting place. Then he invited the young people to create “microclimates of reconciliation” in the places where they live. Finally, gently and firmly he said that the young cannot go through life, nor go through history, without leaving a trace, without leaving a mark on the way. At the end of the Eucharist, the Chileans insisted on giving the bishop a letter. It is an open letter from the young Chileans to the young Bolivians in which they ask for forgiveness. This was the most moving moment of the entire meeting. You could not say that the applause was very strong; people were much too preoccupied wiping their tears of joy. Everything came to an end with the greeting of peace, which had been left until after the benediction. This was the sign that had accompanied us all through the meeting: opening up ways of peace. It was good that the meeting ended in this way. The last word many people said as they were leaving was, “Peace be with you”.